Are you struggling to monetize your blog or wish your blog would pull in more income? 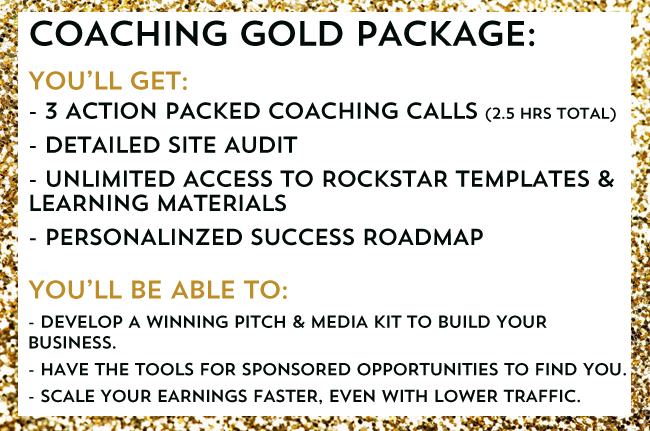 Are you ready to accomplish your next big goal- $1,000 in blogging income a month, more Twitter followers, Facebook fans and engagement? Do you want to know how to talk to major brands and be seen as a key influencer that brands want to work with? (We’re talkin’ free trips, conference sponsorships, exclusive free swag). I started blogging because I wanted a better life and wanted to grow my side income into full time income quickly in order to survive. I began blogging about topics I was passionate about, to better serve other women in a similar situation (frugal, broke and fabulous) and hoped, prayed and wished I could also earn enough money to keep the lights on! Even with lower traffic, I was able to start scoring free product and sponsored posts. I will always remember the day I snagged a free, two night stay and a VIP invite to party at the Disney Grand Californian at Disneyland. I ran around the house, screaming like a kid- I was finally being taken seriously as a blogger, and I literally got to hang out with the big time bloggers I admired at the Happiest Place On Earth. It’s moments like that, which I want to share with all of my coaching clients. That being said, I also distinctly remember the first time I hired my own coach to help build my blog. It was scary and invigorating at the same time- but I will also never forget that feeling. I now make full time income from my blog (over $55k a year) but I still know the value of a dollar and will always remember reaching for the antacids while I reached for my credit card to book my first sessions. Coaching changed my life, and I hope to help you change yours. Shannyn is an exceptional coach. When I was just a little blogger, super unknown and trying to make it in the big bad online world, Shannyn showed me exactly what I needed to do to get partnerships and giveaways with sweet brands I was really into. Both myself and my readers got freebies from cool companies like Ginch Gonch, LootCrate, and ChicoBag thanks to the advice she gave me. Her coaching comes with email templates too, so those of you that are afraid of approaching big brands can literally copy/paste her emails and change some names. Sign up, you won’t regret it! As a YouTube content maker, I know how difficult it is to start a new project especially in the online world. 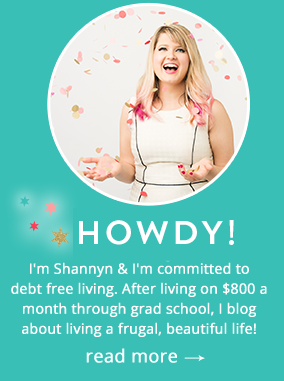 Also as a student, I’m always looking for ways to save money and time and Shannyn’s blog, Frugal Beautiful was all about that. Her Rockstar Blogger Coaching was perfect for me, because it not only saved me time, but I learned from her experience which is priceless. With her guiding me, I was able to achieve more, understand blogging, and build my brand in under two months which would have taken me at least one year to do. If you are hesitating to book her as your coach, just do it, you won’t regret it! The way I see it, you have two options. One: keep doing what you’re doing. You can learn all of this stuff on your own, it will just take you a long time. The other option is to hire someone. Someone like my friend Shannyn. She’s grown two blogs successfully, earned money, scored free products, and has managed to earn a living on the internet. She wrote a book that I reviewed called Rockstar Blogging, and I think it’s the best roadmap toward getting companies to send you things in the mail. If that’s not amazing, I don’t know what is. A Bit About Me: I started FrugalBeautiful.com, my first blog, when I was a broke grad student in Chicago, living from paycheck to paycheck. I started to notice that other bloggers were pulling in serious cash, getting sponsorships to conferences and were running fabulous giveaways with major brands- and they were getting product for FREE. I could barely pay my bills, much less travel to conferences for the blog, so I was desperate to know how bloggers did it, so I could enjoy their lifestyle -of course, without having to spend any money I didn’t have! Though my blog was small, I was able to build my blog into a business. My blog began pulling in enough money to help support my family and NONE of it was from Adsense or other ad networks since my traffic wasn’t high enough, all of the income came from my influence as a blogger. Knowing how to talk to brands and leverage that connection helped me grow my blog even further by launching popular giveaways to grow my followings, and best of all, I didn’t have to spend my money to buy product for giveaways or pay for my own travel.